Skin is the largest organ on your puppy's body, and is the barrier between the outside world that keeps him safe. But injury, fungal or bacterial infection, bug bites and even pollens and molds can result in all sorts of skin problems. These articles describe the different kinds of skin problems, what they look like, how they're diagnosed and treated, including home care options you can perform at home. During hay fever season when people sneeze, have runny, itchy eyes and become miserable from pollen and dust in the air, dogs also can suffer from these inhaled allergens. It's more accurately called atopy and is a seasonal allergy that can make your puppy itch and scratch with misery. 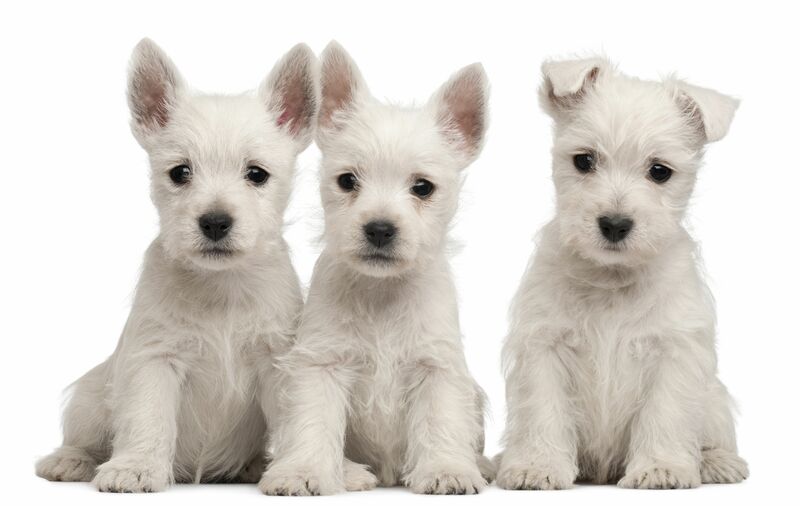 Puppies and dogs can suffer from several types of allergies, including sensitivity to foods. It's not the brand of food necessarily, but the ingredients in the diet. While you may think that a food allergy would cause digestive upset (and some do), in many cases the food allergies can also cause skin problems. Contact allergies are much more common in people than in puppies. That's because the fur appears to help protect your puppy from contact with irritating surfaces or substances. But the puppy's tummy, where there's less fur, can be sensitive to contact with some substances, such as cleaning materials on the floor or fire retardant on carpets. Mange is caused by a skin mite that burrows beneath the skin. Some types of mange mites, such as the ​demodex mite, actually are a normal part of the dog's skin. But puppies that don't have a fully mature immune system can develop skin problems as a result of the mange mite irritation. While most cases of this skin disease aren't serious and puppies outgrow the problem, a percentage of dogs develop devastating skin problems and need medical care. Sarcoptic mange also is caused by a skin might that's difficult to see without magnification. This type of mange is very contagious between dogs--it may even affect you!--and causes severe itching so that puppies scratch and can damage their own skin trying to relieve the discomfort. The veterinarian must diagnose the problem before you can treat it. Ringworm isn't actually a worm. It's a type of fungus that's found in the environment, and most animals (and people) have immune systems that prevent ringworm spores from causing problems. In puppies that haven't yet developed a strong immune defense, though, they may be susceptible to infection. You could call ringworm "the great pretender" because it can look like any number of other skin problems, and is very contagious between pets--and people, especially kids and immune compromised individuals. Ringworm in puppies looks different than on humans, though. You may notice a soft-to-hard or warm, painful swelling on your puppy, following an injury, and this may be a skin abscess. An abscess is a pocket of infection beneath the skin, and because the surface layer may heal more quickly, it seals the festering wound so that the sore expands inward. While most abscesses require veterinary attention and medicine to heal, there also are home care tips that help speed the healing. In this day and age of terrific flea preventive medications, most puppies don't have to contend with flea bites. But some are so highly allergic; it takes only a single bite for them to break out and itch all over their body. Tick bites leave skin sores that can become infected and turn into a skin abscess. Many of the flea prevention treatments also protect puppies from ticks. Fur protects most puppies from sunburn pain. But the sparsely furred bridge of the nose and tummy can become painful if overexposed during sunny days. In most cases, you can prevent sunburn and offer first aid treatment at home. Hot spots are a type of skin infection that becomes moist, hot to the touch and itchy-painful. They may begin from any skin injury--a scratch or bug bite or sting, for instance, could introduce bacteria and from there the infection grows. Severe cases require veterinary help. But some home care and first aid can relieve the discomfort. Yes, frostbite can cause skin problems. Frostbite occurs when tissue freezes--typically that's the tips of the ears or tails or toes, extremities more exposed to cold. Freezing damages the skin so that when the injury thaws, the tissue becomes weepy and sore, and can even die and slough off.